The two units take on very different designs and applications. Knowing when to use one could help improve the performance and lifespan of your equipment. Read on to understand the difference between the two transformers, as well as their respective applications in the arena of power distribution. According to the 2008 NEC Handbook (Section 210.9), a buck-boost transformer takes on the classification of an autotransformer. By definition, a buck-boost transformer is used to increase (boost or step up) or decrease (buck or step down) incoming line voltage to a usable voltage that is required by a machine. In most cases, the difference in required voltage is only between five to 20 percent. For instance, when connecting a high bay LED light that is rated for 240V AC to a 208V source, a buck-boost transformer may be used to facilitate voltage conversion. It is important to point out that buck-boost transformers cannot be used to meet the phase requirements of a machine (for example, single phase to three phase). However, several buck-boost transformers can be utilized to step up or step down three-phase power (note: no phase conversion). Moreover, this type of transformer does not offer stabilization for the supply line voltage, so the output voltage will vary according to the input voltage supplied by the source. The primary role of isolating transformers is to improve the safety of power distribution by moving power from an electrical source to the equipment in an isolated manner. Such components are used to reduce the possibility of electrical shock and decrease electrical noise in sensitive equipment. It can also be used to facilitate a transfer of electric power from one circuit to another – in the event the two circuits should not be connected. When applied as a safety mechanism, the ratio of isolation is 1:1. Like buck-boost transformers, this unit can also be used to step up or step down voltages. Based on the definitions above, it would be possible to differentiate the two transformers from a design perspective. As an autotransformer, the primary (H1-H2, H3-H4) and secondary windings (X1-X2, X3-X4) inside a buck-boost transformer are connected, resembling one piece. In a step down configuration, the primary side appears larger; while in a step up configuration, the secondary side appears larger. The configuration of an isolating transformer takes up more space and is heavier, compared to a buck-boost transformer. This is due to the isolated nature of the primary and secondary windings. A dielectric insulation component serves as a barrier between the two components, which is not present in a buck-boost transformer. Instead, protection comes from the component’s supplying power (no circuit isolation). Additionally, it’s not possible for a buck-boost transformer to create a neutral. As mentioned earlier, from a cost and application perspective, the units are more compact, efficient and cost effective. When a buck-boost transformer is manufactured, it takes on an isolated transformer configuration – with separate primary and secondary windings. When the two components are connected to each other, (via lead wires) the characteristics of the unit adopts an autotransformer configuration, due to the elimination of the isolation through the connection. 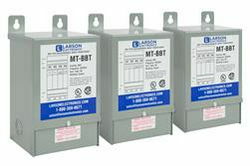 Buck-boost transformers support several applications in industrial facilities. The units are recommended solutions in cases wherein the supply device has reached or is going over its intended capacity. It may also be used in situations wherein the supply voltage is low due to the installment of a machine at the end of a bus system. If the facility has high power demands, resulting in a cutback in supply voltage, a buck-boost transformer can be applied as a remedy. Most operators simply use the unit to rectify off-standard voltage to ensure compatibility and maintain efficiency. For industrial lighting systems, this could be from 110V to 120V or from 240V to 277V. Isolation transformers may also be leveraged to convert supply voltage to meet the electrical requirements of equipment at the work site. The units are suitable for managing spikes and harmonics from incoming power, as it is passed on to the machine. A huge benefit when using an isolation transformer is its ability to remove risks associated with coming in contact with a live connection while one is earthed.